How come I can't find anything anywhere on the KLH 5's? I've searched and searched the web, tried eBay, virtually nothing anywhere. From what I remember, they were top of the line speakers back in the 70's. They were the first set of quality speakers I had. I got them with a HK 930 in 1974. I don't remember them much as I sold them three years later when I went with Phase Linear 700B and 4000 with AR-11's then Phase Linear Andromeda III's. Anyway, from what I remember, the KLH's were highly rated, maybe even right up there with the AR 3a's. Any ideas? Thanks for the replies. My thoughts.....yes, I saw last night the KLH 5's on Ebay. Two things I noticed right off....they don't look like I remember mine looking and I'm absolutley positive my Model 5's had 12" woofers. I bought them through a wholesale company in Illinois in March 1974 along with a HK 930 receiver and an Elac Miracord turntable. I remember having the speakers down to either the KLH Model 5's or the AR 3a's and I picked the KLH's because they were said to have a little brighter sound than the 3a's, which would be preferred with rock music. If the 5's were made from 68-72, I wonder if mine might have been a second series or something, since I bought mine in 1974. Well anyway, I hope someone can find some information on the 5's, I'd really like to figure this out. A PR. OF KLH # 5 SPKS. ON EBAY WITH PICTURE. SEEM TO LOOK LIKE THE ORIGINAL LARGE ADVENT. MID . AND THE KLH CONE TWEETER. Manufactured 1968-1972 w/ a list price of $470/pr. Retail used (in 1995) was $51. If anyone has better pictures, manuals, and/or any repair/upgrade stories on the model 5's, please send them over! I just captured the picture on Ebay and I'll put it online in a few minutes. I also have a pair of AR3a's and I can tell you that the model 5s definitely have a "brighter" sound... they're considerably more efficient too. I've driven them with a p-p 6bq5 amp. with good results... I could never do that with the 3a's. I would definitely like to get as much KLH information online as possible. I don't have much of anything at this point. I'll send you an email with my mailing address. Jim:If Mark's gonna post the sales lit here, I'll just get it here. I have a pair of Model 5's coming. They should be here any day now. I got them off Ebay. Also, my buddy has a pair of 3a's he said I can have, so I may end up with those, too. There's a guy with a site on the web that has ALL the reviews done by Audio, High Fidelity, and Stereo Review magazines from back in the 50's into the 80's. They are not posted on his site, you have to order whatever review you want and he will make you a copy and send it for five bucks. I'm gonna get a review on the Model 5's done in 1968 in Stereo Review. If you would like to post it here when I get it, I'll ask him if it's OK. If you want the URL to his site, I can post it, too. Also, once I get the 5's, if you want some better pictures, I'll take some and send them. Pictures of your model 5's would be great .. so far I only have the one picture in the KLH section. I have some KLH magazine reviews, but I'm not done getting reprint permission for the articles that Rick sent over. (Thanks Rick!) I believe the KLH Model Five is in the packet, but I'll have to check again. Well, I still haven't received my Model 5's. I just sent the guy an email asking when he shipped them. Well, my Model 5's finally came today. The cabinets and the grills are pretty rough, but they sound great. All drivers are working very well, and the three postion switches on the back work, too. I think what I'm gonna do is "re-veneer" (is that a word) them and get new cloth for the grills. Then they'll look as good as they sound. One thing I'm gonna need is the KLH "badge" or whatever it's called for one of them. Anyway, they sound great and I'm well pleased. Mark:I'd prefer waiting until I redo them to send you pictures. As I said above, they're pretty rough. Maybe I'll take before and after pictures. I'm a newbie here. I just bought a fine pair of vintage KLH 5's. I started collecting vintage stereo gear about a year ago, like Marantz 2270 & 2325 recievers, Marantz 5020, 5025B, and SD-9000 cassete decks, Marantz imperial 7 speakers (killers.....real sweet!). I am very interested to see how the KLH 5's sound! I think either of my recievers should have more than enough power. 2270 is conservatively rated at 70 WPC & 2325 at a whopping 125...also very conservative by Marantz standards. Would really like to here from some of you who may have a KLH 5 setup, and how you like it. KLH Model 5 was a "refinement" of the Model 6. As I recall, it used the same woofer and tweeter but overcame the objection some people had to two way systems by using a pair of the excellent 4 inch drivers used in the KLH table radio and some of its other units as midrange drivers. This increased its power handling capacity and smoothed its frequency response. For some reason I cannot understand, I don't think it was nearly as popular as the 6. The difference in cost was about $100 a pair. I don't think it was the equal of AR3a in deep bass capability. 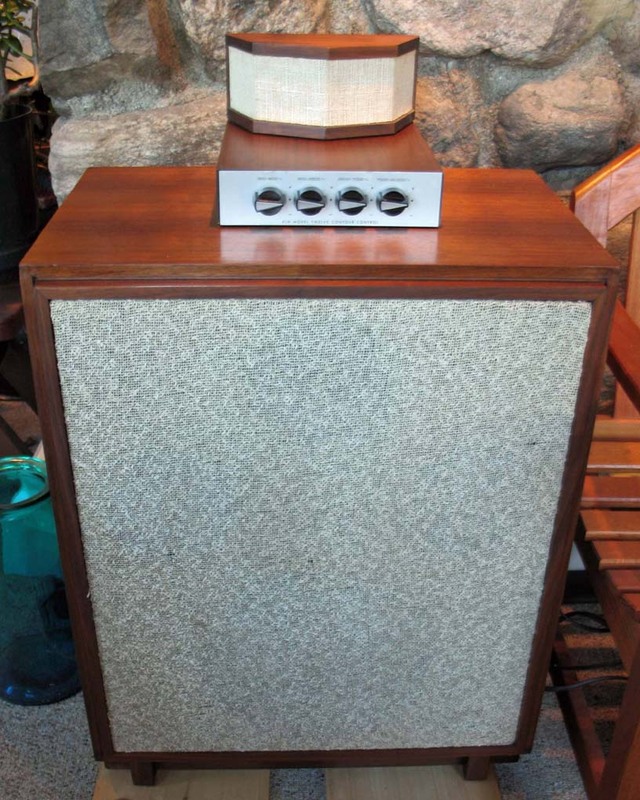 The top of the line unit in those days was the KLH model 12. I think that by that time the model 9 electrostatic had been discontinued. The twelve was a three way low boy floor standing unit which had an outboard control box with 4 three position frequency equalization switches. Do you think that the people who designed the controls for AR9 had seen that idea and liked it? For some reason the model 12 didn't seem to be a big seller for KLH either. Perhaps it was the price. It was far higher than the 5 or the 6. I think about $800 a pair versus about $350 and $250 for the others. The nice thing about KLH units is that so many of them have stood the test of time without any apparant deterioration. The materials were built to last and last and last and so they have. It's rare that the woofers have to be reconed or the level controls have to be cleaned or replaced. I only wish AR speakers were equally durable over time. A pair of refurbished Model-5's I bought were delivered yesterday and those are a pair of smooth sounding speakers. The numbers place the year of manufacture in 1968 and the man that rebuilt them has them looking and sounding like the did back in 68. I think this is a really great sounding and looking classic speaker. I have a pair of AR-4x's, AR-6's, and AR-8's so this is the first three way speaker in my collection. I was surprised how effecient they are too. The same guy is working on a pair of AR-3's so I hope to add those next. Carl Richard recapped my Model Fives for me recently, and I find it hard to believe that they could have sounded any better than this when they were new. I agree with you. The Model Fives are great speakers. I would like to give a nod to Dudley Chicoine ( Tech 1 Electronics ) who refurbished the pair I now own and enjoy. I'll get many years of use out of theses fine speakers. If you love the Fives you'll LOVE the Twelves--same drivers, bigger box, external adjustable crossover. Great! That's a great looking speaker. It looks about the same size as the new VW I bought in 1969. Did you buy them new and what did you drive them with? There are two sets of model 5's on ebay right now. one set doesn't look that good and they wants 399 dollars and the other set looks great with a starting bid of 199.99 . the speakers for 199.99 have a youtube video. this topic is very old. from 2001. I wonder if we should start a new topic to talk about these speakers. Pretty elaborate ebay listing with that YouTube clip. Too bad the guy didn't use spell check! $399 huh? Well worth it, but these big speakers don't seem to sell. Low WAF I guess. no idea what that means. I wonder if i should ask him a question about the 250 dollar price tag with free shipping. maybe a new coat of oil will clean them right up. the guy that has the set for 399. if you read his listing it says he lowered his price to 250. but he never changed the listing. that could be. I may of read it wrong. I dont see were a pair of these would sell for $650 but you never know. I liked the one set that ended with no bidders. Yeah--those Nines are really something. I see THREE pair of Twelves on ebay now. These are strictly for someone who can go pick them up, and who has the room, but they are really nice. Mine are not in my main listening room so I don't get the full effect. They were being driven by an AR amp. Now using a much more powerful Sylvania RQ-3748 receiver (very nice and much overlooked), soon to be replaced by a MAC4100. The Sylvania RQ-3748/KLH Twelve was the ultimate CHEAP CHEAP super-audiophile system. I paid $100 for the speakers, $100 for the receiver and a few bucks on new capacitors. An absolute killer system for under $250!! !